Chaldiran (چالدران) today is a small, sleepy town in northwestern Iran near the Turkish border. Yet, nearly five hundred years ago to the day, on August 23, 1514, the plains outside of Chaldiran groaned under the weight of men and horses and thundered with the sound of cannon-fire and muskets. The Battle of Chaldiran is one of the most pivotal battles in the history of the Middle East. Rather than being an obscure footnote in history, it was a battle of pivotal importance, with results that still reverberate in the modern Middle East. By determining the borders and demographics of the Persian Safavid Empire and the Turkish Ottoman Empire, the Battle of Chaldiran created the contours of the modern Middle East. In the early 16th century, two empires were competing for eastern Turkey and the Fertile Crescent (Iraq and greater Syria). One of these was the Sunni Ottoman Empire, based in western Turkey and Constantinople (Istanbul). While its ruling class was Turkish, the majority of its subjects were still Christians from the Balkans. The other empire was a new creation of the era – the Safavid Empire. The Safavid Empire was founded by the leader of the Shia Sufi Safaviyya sect, Shah Ismail, who was of mixed Turkish, Persian, and Kurdish descent. Starting a series of conquests from a small principality in Azerbaijan in northwestern Iran, Ismail impressively won his first battle in 1501 at the age of 14. By 1510, only nine years later, he had conquered all of the Iranian Plateau and the city of Baghdad. 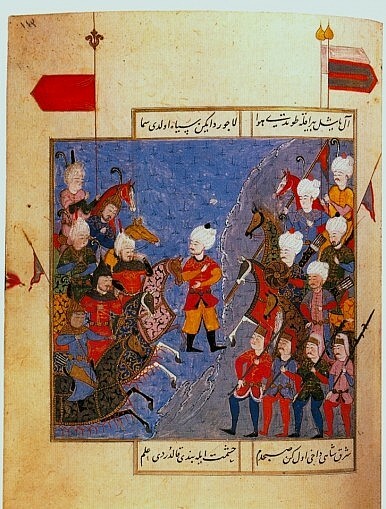 Ismail’s eastern campaigns checked Uzbek power and helped a prince named Babur set up his Mughal Empire. The sudden expansion of this Safavid Empire was a serious threat to the Ottoman Empire territorially; the Safavids further destabilized the Ottomans by propagating Shia Islam among the Turkish tribes of eastern Turkey (much of Ismail’s forces consisted of Shia Qizilbash Turks). The then Ottoman Sultan Selim I decided to confront the Safavid threat directly by marching east, suppressing the Turkish tribes of eastern Turkey and arriving at Chaldiran, where the Safavids and Ottomans fought on August 23, 1514. The battle ended in a decisive Turkish victory, aided by their mastery of gunpowder technology. Their victory cemented permanent Ottoman rule over eastern Turkey, most of Kurdistan (expect a portion that remained with the Safavids and became mostly Shia), and Iraq. The Safavids, who had depended heavily on cavalry and made minimal use of gunpowder, were shocked by their defeat, which was Ismail’s first and last defeat. He never fought another battle and spent the next ten years of his life drinking. He died in 1524. The Battle of Chaldiran had an enormous impact on shaping the modern Middle East, its boundaries, and its demography. The most important legacy of the Battle of Chaldiran is that it led to the creation of a relatively compact, Persian-oriented, Shia nation-state on the Iranian Plateau. The defeat of the Safavids at Chaldiran prevented them from building a sprawling empire spanning much of the Middle East by denying them control over eastern Turkey and most of Iraq. This led to the border between modern Iran and Turkey and Iraq (successors of the Ottoman Empire) today, and ensured that the vast majority of the region’s Arabs and Kurds remained Sunni. Many historians are of the view that it was a good thing that the Safavid Empire remained compact instead of sprawling over the Middle East because then it would have overextended itself, only to collapse. The relatively small size of the empire, as opposed to its larger neighbors, the Mughal and Ottoman Empires, enabled the bureaucratic consolidation of a region that has previously experienced several hundred years of political instability. As a result, the state of Iran has a greater coherence to it than its neighbors do, many of whom were ruled indirectly by the Ottomans through tribal intermediaries. More important than the consolidation of a nation-state in Iran, the battle ensured the spread of Shia Islam within the Safavid Empire. After the battle, the Safavids aggressively promoted Shia Islam within their territories in order to consolidate and separate their empire from its Sunni neighbors. Although this lead to the Safavid Empire being surrounded by a sea of Sunni Islam, historians also believe it ensured that the empire was not absorbed by the Sunni Ottomans. To make sure that Shia Islam became irrevocably accepted by the population, Ismail made it mandatory for Shias to curse the first three Sunni Caliphs, offending Sunnis and leading to continuing antagonism between the Sunnis and Shias throughout the region. Although many Iranians might regret the manner in which Iran became Shia, they accept their Shia identity with pride as a marker of their distinct identity. It is important to note that Ismail decided to impose Shia Islam on his territories partly due to religious reasons as well. While it is widely known that Iran is Shia today, what is not as widely appreciated is that it was not so until the Safavid Empire came to power. Sunni Islam (and Zoroastrianism before it) was the norm in Iran as it was throughout the Islamic world, with Shias scattered throughout the Islamic world in small, local concentrations — similar to the way in which Jews were concentrated in certain areas throughout Europe without forming a majority in any one region. Ismail’s conquests had the effect of creating a large Shia block in the midst of a previously Sunni region and were essentially the expansion of one small concentration of Shia Islam in northwestern Iran. The majority of regions today that feature geographically concentrated heavily Shia populations today are those that were either part of or influenced by the Safavid Empire. These regions include Iran, Azerbaijan, Bahrain, southern Iraq, and western and central Afghanistan. These regions are almost completely surrounded by Sunni majority regions that begin almost exactly where the Safavid Empire’s boundaries ended. Ironically, the exception to this rule is southern Afghanistan as it was the Safavid Empire’s attempt to forcibly convert the Pashtun Afghans of Kandahar to Shia Islam that sparked the rebellion that led to the Safavids’ downfall in 1722. Thus, the Battle of Chaldiran is responsible for the “where” and “why” of most Shia Muslim populations in the Middle East today. On the other hand, the Battle of Chaldiran led to the transformation of the Ottoman Empire and its dominance of most Arab lands. As the Ottomans secured their eastern flank by annexing Kurdistan and Iraq, they were able to turn west, conquering Egypt and the Levant in 1517. In just a few short years, the Ottomans acquired an Arab Muslim population that vastly outnumbered the ruling Turks and the Christians who had previously made up the majority of the empire. The majority of Arabs thus lost their independence to the Ottomans as the direct or indirect consequence of Chaldiran. Additionally, the Ottoman Empire became more solidly Muslim, orthodox, and traditional as a result, decreasing its ability to absorb lessons from Europe. Ottoman rule maintained Sunni Islam (the Ottoman Sultan claimed to be the Caliph, after all) over most of the Arab heartland but also led to the relative neglect of Arabs and the Arabic language. The Ottomans tended to rule the Arabs indirectly unlike their Turkish heartland, which was administered thoroughly. This was perhaps a consequence of having such a large, sprawling empire. The legacy of this lack of state-building is evident in Arab countries to this day. Today, as the 500th anniversary of this epochal battle approaches, we should reflect on its outcome and how it created the modern Middle East. When we consider the various tribal, ethnic and religious cleavages that make up the Middle East, as well as the relatively successful formation of the Turkish and Iranian states, we see the results of the Battle of Chaldiran. Although the battlefield itself is not commemorated with any monument save for the tomb of two of Ismail’s viziers, its impact can be remembrance enough. Moscow’s diplomatic push in the Middle East will fail, even as it loses influence in more vital regions.